Team Suzuki Press Office – October 27. • Andrea Iannone with impressive pace again. • Alex Rins sticking close to his team-mate. • Team SUZUKI ECSTAR ready to push at the front. Saturday morning’s FP3 session served as a good ‘warm up’ for the tricky conditions which lay ahead for the riders. Strong winds and chilly temperatures, as well as highly varied track temperatures, made for a difficult session. Nevertheless, Andrea Iannone and Alex Rins, both fast on Friday, secured direct passage to Q2. In the calmer FP4 session both riders were able to show their promising pace once again, with Iannone impressively topping the time sheets. 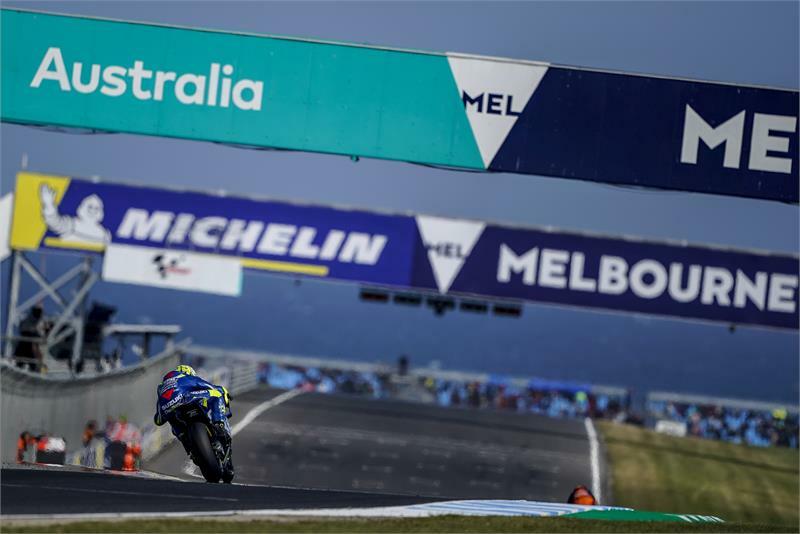 As Q2 arrived, so did distracting and worrying rain spots, but Team SUZUKI ECSTAR’s riders were able to put their confident feelings with the bike to good use with Andrea Iannone and Alex Rins taking 4th and 5th on the grid respectively, giving them a good boost for tomorrow’s race.